Jodie Broaders is a London based fine artist with a deep passion for music. Like many of us, he channels this inspiration into his artwork and allows it to reveal itself. 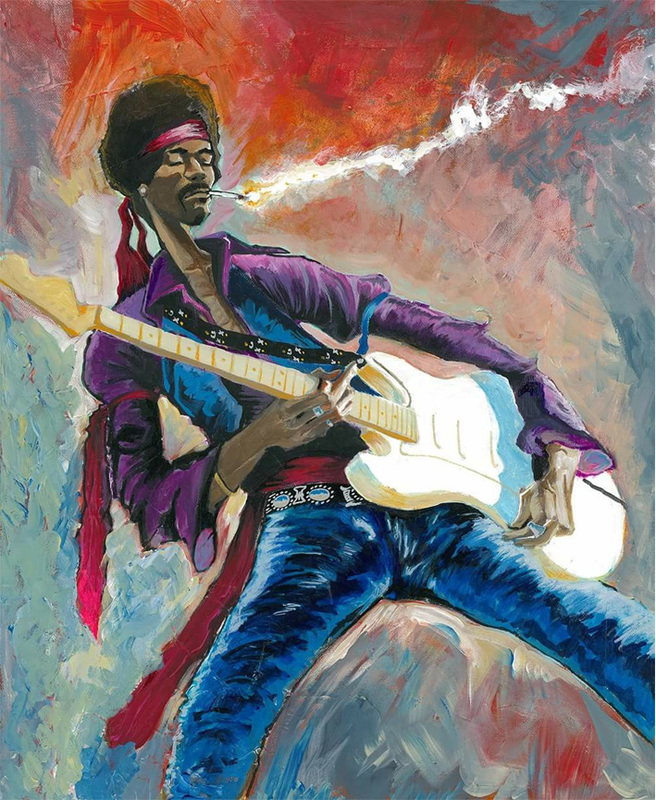 He recently created a series of musical icons, allowing each style, technique and pallete to be determined by the music, the artist and the personal journey he has taken through his life experiences around their music. David Bowie was a legend. One which I am very sad to have seen pass away earlier this year, hence the reason for painting this portrait. I have always been in awe of his ability to reinvent himself over his career and keep nearly everything he created fresh and new, yet still, Bowie. 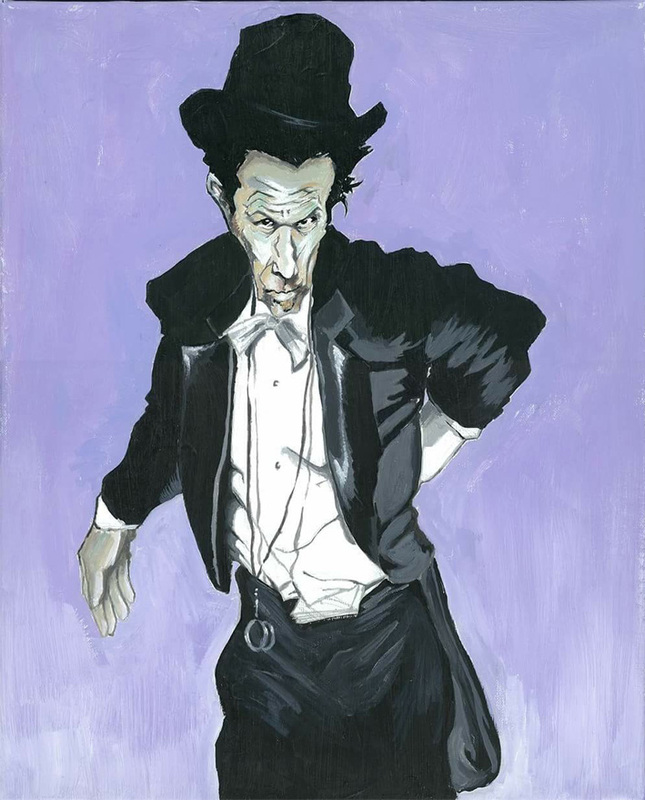 I wanted the portrait to have an almost ethereal quality, given his recent passing, but also connecting to the way in which the characters he created were fleeting and then onto a new subject, character or theme. 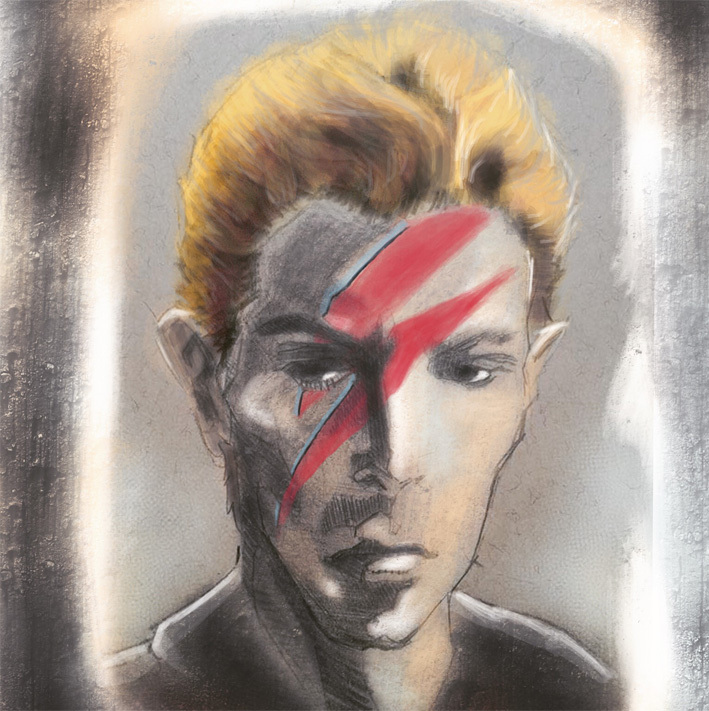 But of course I have a huge love for the Ziggy Stardust character and album, and painting the infamous lightning bolt on his face just seem to feel right. To me he is almost like a rogue: in his music and lyrics you can hear that he is not trying to appeal to mainstream audiences and he does things his own way. The track I was listening to the most while painting is “Goin’ out west” which to me conveys how I see him, a rebel who is cutting loose from everything and everyone. In my painting I wanted to try and give a sense of this, his eyes and general demeanour invite you to try and contradict or challenge him. But you should be wary, as he may be holding an ace up his sleeve or a gun behind his back. I wanted the attention entirely on him and for this reason I decided for a very soft background, both in terms of tone and texture. 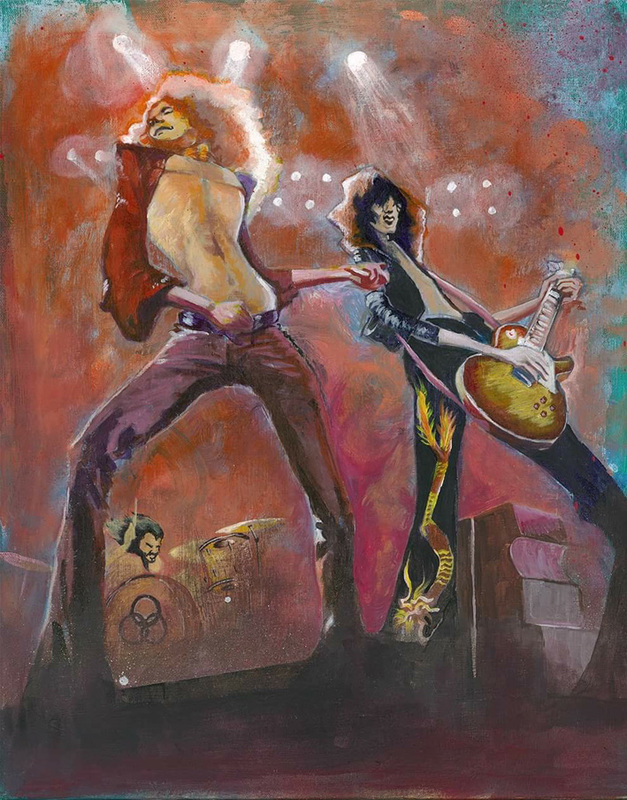 I find it hard to summarise the band that is Zeppelin as I could go on for hours. But I suppose to me, everything that they are as a band is just so perfect for me, the sound, look and presence they created is one of a kind. From Page’s intense licks, Bonham’s thunderous rhythms to Plant’s incredible voice, it just all fits perfectly. I also love the fact that their music includes not just blues and rock, but folk and literary influences as well, taking inspiration from the pages of Lord of the Rings or Irish folk music. While painting this piece I really wanted the perspective to give you this feeling of grandeur and spectacle, almost as if you are in the audience watching these guys do what they do. I also think it gives the subjects a larger than life feel about them as they are towering above you. Much like Tom Waits I think that Keith has a very rebellious side to his character. But more than that he just seems no to care what anyone thinks of him. I think that really comes across in his style, the scruffy hair, almost pirate like dress sense, rings on nearly every finger, chain smoking, even his rough slurring voice is hard to decipher now. 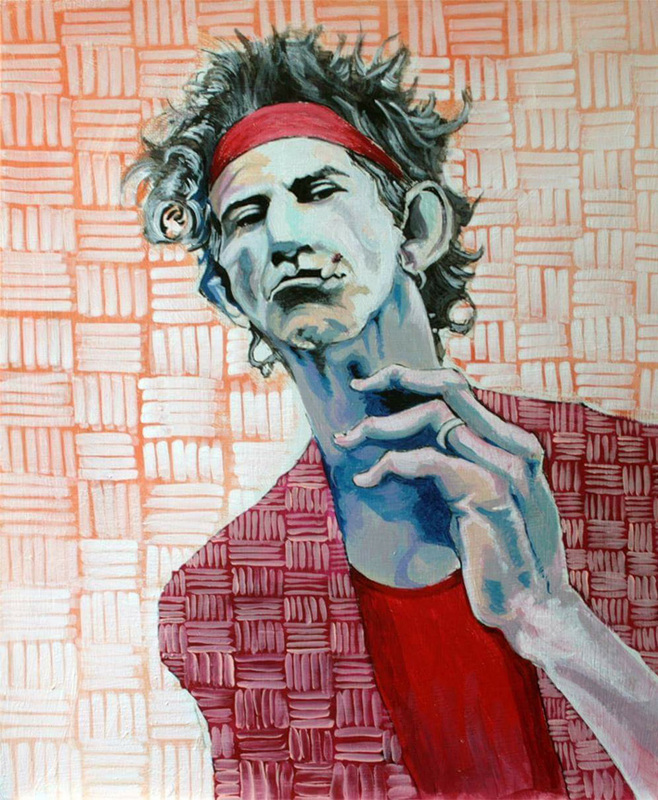 His charisma makes him stand out from the Stones and this is something I wanted to convey in the painting in the way that although sharing the same pattern on his jacket to the background it contrasts enough to give him his own presence. Jimi, to me, is the greatest guitarist that ever lived. In listening and watching him play you can’t deny that there is a perfect symbiosis between him and his music. He seems free of constraints to the point where even when audiences wanted to hear their favourite tracks he would play what he wanted to play or add something new that was not part of the original piece. I really wanted to convey all of this as much as possible in the painting. The background represents the different colours and textures of sound he was able to create with his music. I decided to paint him with his eyes closed to show the ease with which he commands the instrument but also to emphasise that music for him was an intimate moment. He is playing first and foremost for himself, knowing that his music will reach out to people anyway. 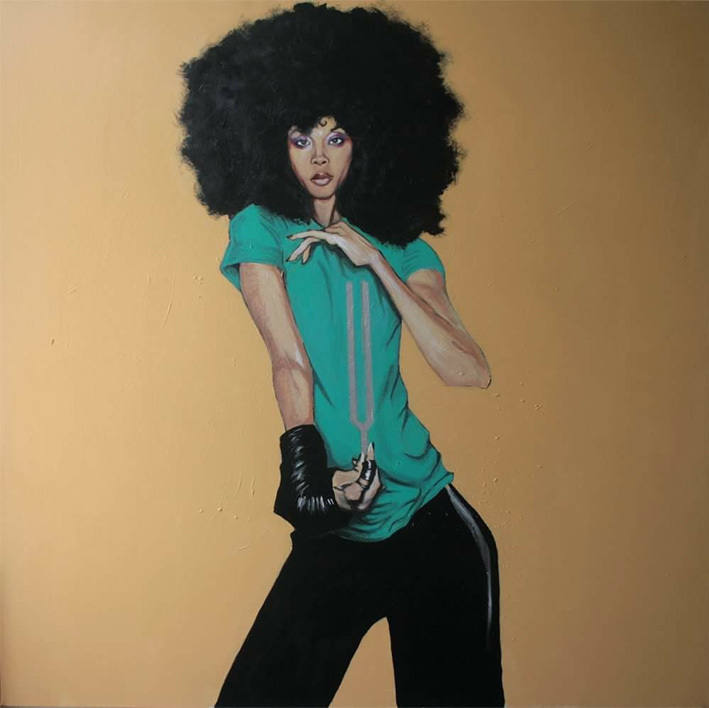 Unlike the other musicians I have chosen to paint, Erykah Badu has quite a different style and of course her genre of music is more soul than rock or blues. She has an incredible voice and her ability as a lyricist is legendary. While painting this portrait I wanted to exaggerate her body and curves to be almost like she is flowing through the canvas, and the tuning fork she is holding conveying that like her music everything is ‘in tune’.